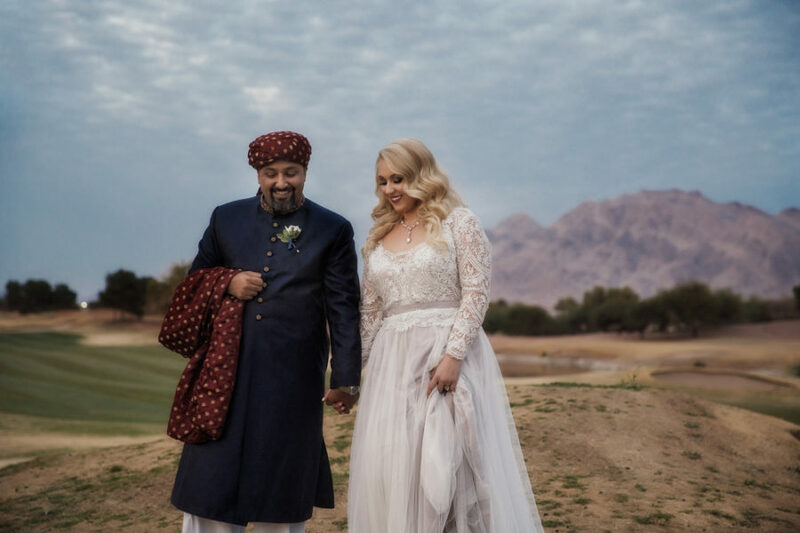 Wedgewood weddings Las Vegas located inside Stallion Mountain Golf Course is a ceremony and reception venue specializing in gorgeous scenic weddings in Las Vegas. 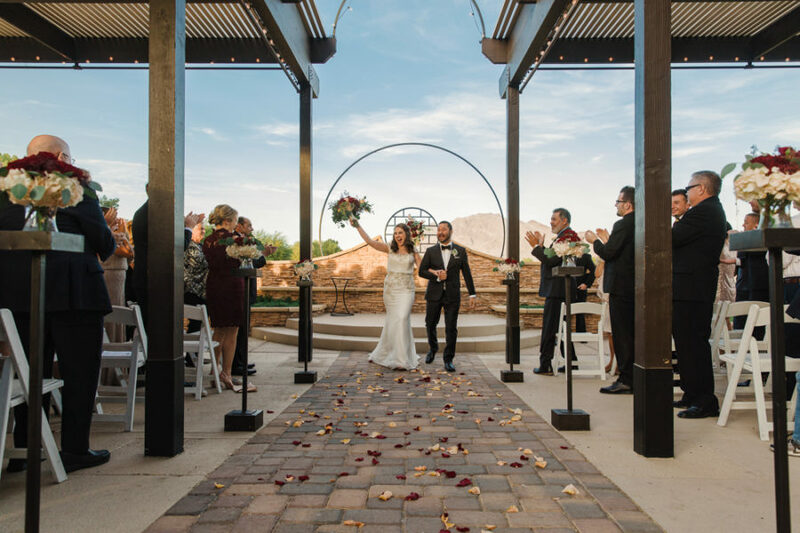 Couples can choose from three different unique ceremony sites: The Patio, which features a large canvas awning and misters to keep guests cool during hot Vegas evenings. 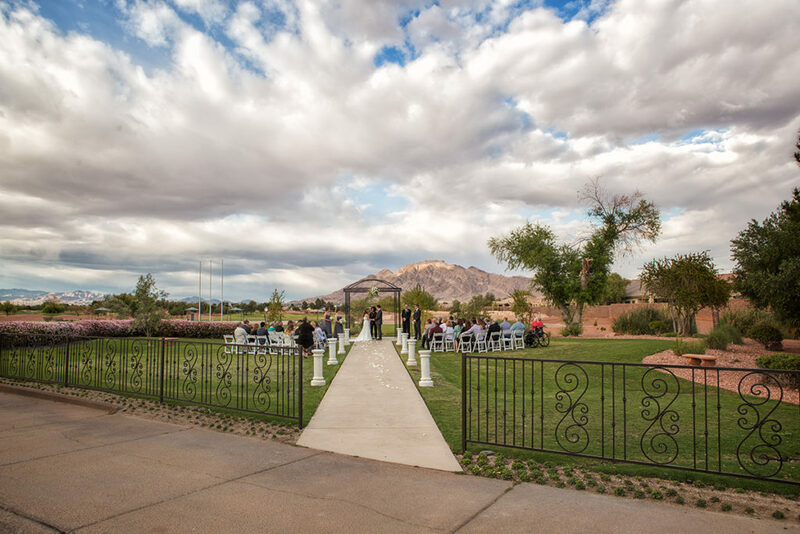 The Patio also features a stunning view of sunrise mountains which will be your back drop during your ceremony. At the Garden ceremony wedding site guests are seated in the grass on either side of a stone aisle way leading to a steel rotunda where the backdrop is also the mountain landscape. Last is the only indoor location; The Chapel where two walls of windows wrap around the room revealing the entire mountain-scape and the green rolling hills of the golf course. Following the ceremony guests can enjoy cocktail hour in one of two large bar areas. Both bars have doors leading to the foyer, reception room and outdoor lounge areas. 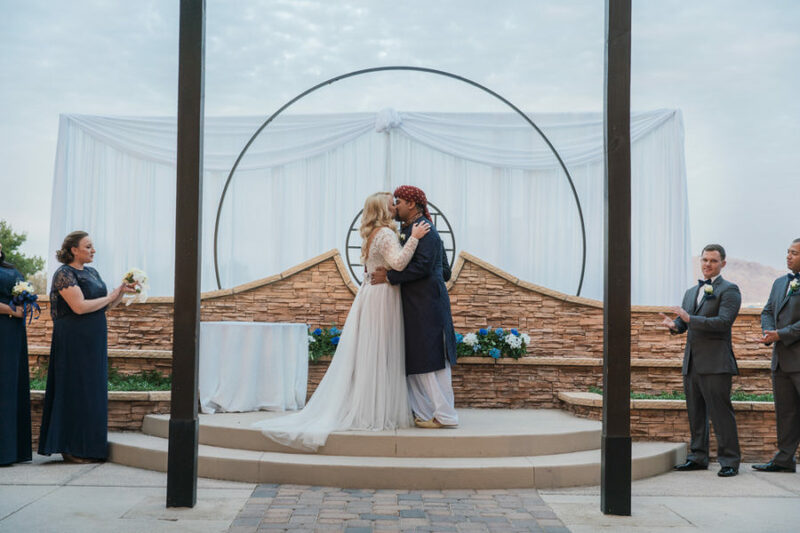 After their grand entrance, newlyweds can share their first dance in front of wrap around windows overlooking the golf course in The Citation room or The Sunrise room. The elevator takes Brides to the second story where an enormous bridal suite is prepared to accomodate anyone from just the bride to an entire bridal party and hair and makeup artists. Plenty of natural light pours in when the blinds are raised so photographers can capture brides getting finishing touches on their makeup and bridesmaids fastening her dress. Photos of wedding dresses are often captured against the backdrop of Wedgwood’s tall, walnut amoire and the bride can pose on the quaint leather sofa fanning out the train of her dress and showing off her shoes. As Wedgewood las vegas’ only exclusive photographers, SS Co studios we have exclusive privileges to golf carts and full reign of the course for picture purposes. SS Co Studios has been wedgewood las vegas’ exclusive vendor since it opened in las vegas back in 2013. 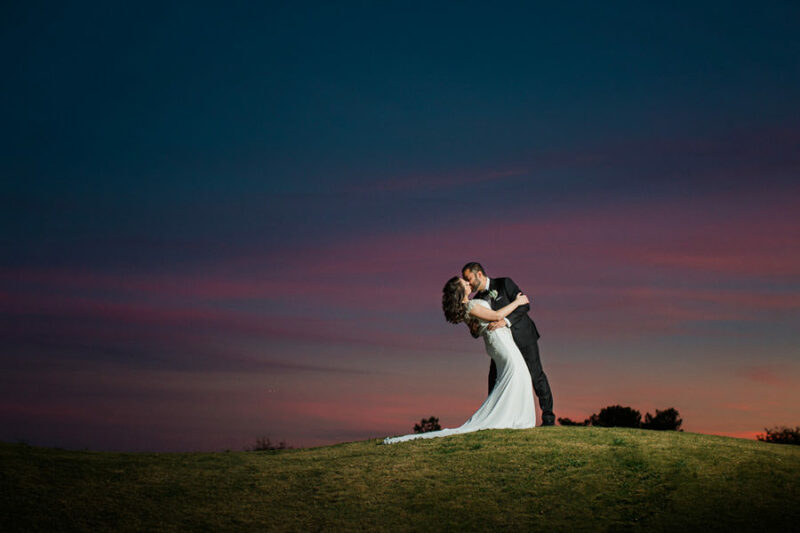 Shooting at Wedgewood almost weekly and working closely with the entire staff has given us many opportunities to become familiar with the golf course and where wedding day photos are best taken. We are not only concerned with the aesthetics of the background but the way each location is lit and at what time of day it appears in that light. Having that knowledge helps to eliminate any time searching for somewhere to take creative photos on wedding day. 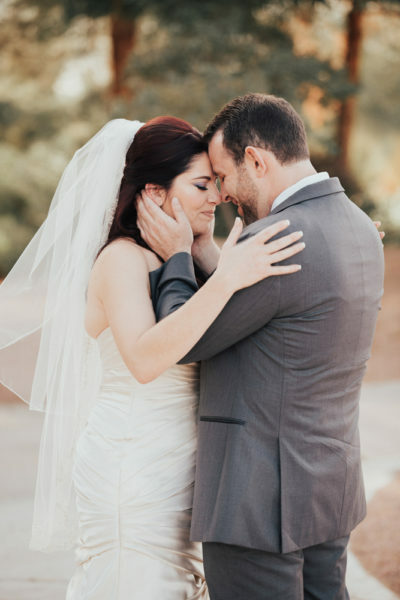 One of our favorite aspects of being preferred vendors at Wedgewood is the relationships we’ve been able to develop. The sales staff, DJ’s and banquet staff know us and how we work best and we have witnessed the same for them. This way the staff knows they can always trust us to keep our commitment to our clients to get amazing images of their wedding day and at the same time be sure to only work in a way that doesn’t inhibit anyone from creating their best product. The DJ’s are always in close communication with us so we can easily be one step ahead of reception events and sure to capture anything that unfolds. Sales and coordination can quickly fill us in on details about our couples before wedding day or the day of. 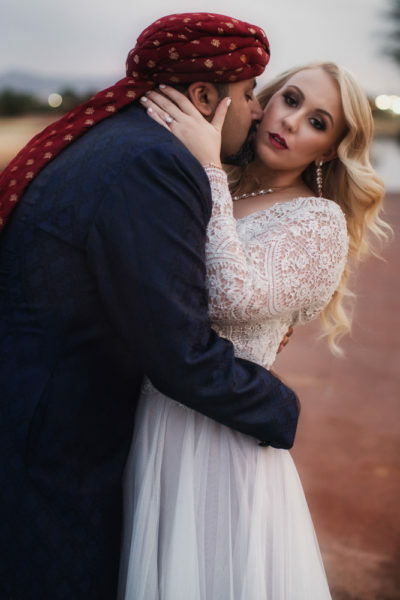 We are thankful for such great relationships at Wedgewood that allow us to easily produce what our clients expect of their wedding day photos and what they deserve!